Hawthorn's Brewshed Collection is the home of the brewing company's occasional limited releases. To date, they've been draught only and also a step or two away from the more traditional, straight down the line beers that form its core range. To date, there's been a hoppy rye red ale, a spiced witbier and a spiced dark ale, with number four bearing New World credentials too. That said, it's a beer closer to those upon which the business was built. It's a lager featuring all New World ingredients: Kiwi wheat and pilsner malts plus hops from there and here, yet it remains very much a lager. What do we mean by that? 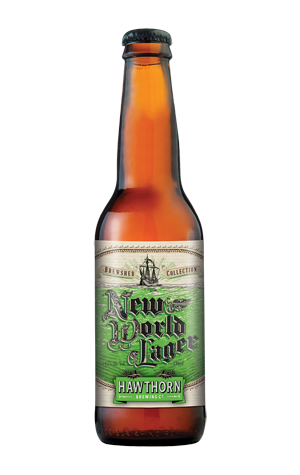 Well, often if you hear New World attached to anything, there's a tendency to imagine something hopped to the eyeballs, possibly boosted in terms of booze and quite probably packing serious bitterness too. This doesn't do any of those things, instead using said ingredients to create a beer that is very reminiscent of the Old World lagers that took over the planet in the last century then decorated with subtle Southern Hemisphere flourishes. The distinctive pilsner malt and lager yeast characters are there, but they're accompanied by hop derived tropical and lime like flavours and aromas. It's a highly approachable beer ready for the warmer months ahead and also the first Brewshed beer to appear in bottles, featuring artwork by Jessie Jungalwalla, whose work you'll soon see appearing in and around Crafty Towers too.